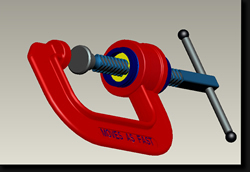 Max Orbit Pty Ltd is a wholly Australian operated, supplier and distributor of customised Clamps and Vices. Max Orbit was built on one guiding principle: Design TIME SAVING, INNOVATIVE TOOLS. We listen to our customers, our products are born through our customers demand and specifications, and our R&D is driven by real life work applications. With more than 30 years experiecne we supply high quality customised tools, with competitive pricing, and we aim to take the extra step to make our customers happy. Now you can increase your productivity with our new QUICK ACTING CLAMPS and VICES that save your valuable time by 95% and increase clamping pressure up to 50%! Exhausted from countless handle turning? Now you can fasten and release in 2 second, in 1 single turn!